I was just informed that Ohloh is now providing open source projects with a download service. While I haven’t tried it just looking over their FAQ seems like this could be really helpful to many smaller projects, well even bigger ones I think! CDNs, ability to access the access logs, cli uploads as well as web interface – Really cool stuff in my opinion, not something we can use for projects like PEAR but I know countless projects that could make use of it! Thanks to Scott Collison from Ohloh for informing me, I need to try this out as soon as possible to see if it actually works as nicely as it sounds. Now the PHP Barcelona 2008 conference is almost over, I am sitting in the last keynote of the day – Derick is talking about XDebug. PHP Barcelona 2008 is a user group run conference, costing only 20 Euros for people to attend and it managed to garnish around 200 – 300 people, which shows that the PHP Spain scene is quite vibrant and alive. The conference was run really well and the venue is truly amazing, given people paid 20 euros to enter, everyone went wow as to the quality given the payment ratio. This is a conference to look out for in the future and I for sure am gonna attend next year if possible. I gave my Deploying website with the pear installer talk: http://www.slideshare.net/helgith/website-releases-made-easy-with-the-pear-installer-barcelona-2008-presentation/, I’ve updated it a bit and changed it, the talk it self went really well – ran 5 mins over, people seemed somewhat confused but I had really good feedback, both on pear and the talk it self … How I can improve them and in general good questions. So hopefully they will have another conference next year, this one was too well run to not do it again. See ya there! Next weekend I’ll be talking at the PHP Barcelona conference (27th Sept) about how to deploy your website with the PEAR installer. So do come by to the conference, by the really small fee about 20 euros, fill up the conference and have a beer or 10 with us afterwards! So I’m sitting here in Skien recalling the last 2 days in Amsterdam so I can write something really intelligent about it but I’m being somewhat foggy on some of the details :) Actually half of this blog was written after Skien since my laptop crashed mid way through this blog *sigh* – So I was even more foggy for a while. Zeev’s keynote was kinda like what Andi went on about back in Chicago – Saw the same slides in some case, history of PHP, where we are going and fun things like that, I know some people liked it but I must admit I was not impressed per se, maybe because I have seen Andi do most of this before ? Who knows. Anyway on stage came Marco Tabini, a person I’ve never seen talk before and he had a interesting keynote title, Software and the taste of mayo, and I must say I was really happy with seeing how it turned out. Marco managed to pull off being his usual funny self and still get his point across, he talked about how software and services get over engineered, bloated and simply poorly written, for comparision he used mayo – real mayo is made out of three ingredients where as for example hunts mayo is made out of 50 or so ingredients which can more often than not be reflected to software and how they are handled. A good talk. Next up was Derick with his eZc talk where he went on to explain what the whole concept is, introduced what I like to call their better components and show example but 45 mins didn’t make it justice, Ivo make the talks longer next year! And add another conf day :) This talk convinced me to look deeper into ez components and use more components than I already am. PHP Security by Johann, I was expecting something different than what he talked about – It ended up being more like, not sure what to call it, a very dry university professor lecture, a lot of stats about why people are exploiting web apps, now and 5 years ago – names of some ways to run a security audit and basics about how you should do them. It didn’t catch my attention and I was really bored in there but people around me seemed very happy with it and thus I must deem it a success even tho I felt I was in 101 class. The last talk I attended was Ivo Jansch session about Enterprise PHP Development. In there he used a nice metaphor about blocks to build a house in accordance to development , I must say I enjoyed the talk since he was talking about this I tend to ponder on a lot in projects I’m involved in but I was quite surprised that people in the talk seemed to find some of the topics Ivo touched on to be new to them. Good thing Ivo just published a book about it at PHP Arch. I was going to end this blog post with something along the lines of “make the topic more advanced for next year around” but evidentally that should not happen since in many of the talks I looked into people seemed generally puzzled but I did hear the random “I felt I was back in pre-school”, so my advice to the conf holders, do a mix of both, add a extra conf day and everyone will be happy. Anyway this is a rather short wrap up but should give a good idea that I really liked this conference, good to see we still have a decent conference in Europe (unconfs not included in this statement :P they always rock) and I’m going again next year, hands down and so should you! This is the first time I’m seeing Sebastian talk even tho I’ve been to couple of conferences with him so this is a new and hopefully fun experience. Another reason why this session is interesting to me is because I’ve been dabbling in phpt all my life, everytime I’ve come across PHPUnit in a software where I have some say in it, I convert it to phpt BUT those are usually PHPUnit v1 which is well … not pretty – I used to use it in some PEAR packages, felt a bit over the top. Having only touched on v3 a weeeee bit so I’m hoping Sebastian will bring some new light on this and make my mind a bit more open for v3 and v4. Quite funny tho when I was writing the above sentence that Sebastian was talking about that unit tests should be easy to write, I’ve always found the barrier to be higher for PHPUnit than for phpt, maybe it’s just me ? I have always believed that one file per test, it feels like PHPUnit encourages putting many tests in one file which kinda feels … messy, maybe it’s done because people don’t want to be extending some class all the time and fun fun things like that. Tho as Sebastian points out, phpt is more of a standard and it’s not a unit test framework but in my experience it’s pretty easy to throw in most of the basic functions that people will use in PHPUnit, that’s something we did in pearweb – mock DB, assert funcs and all that but no doubt it doesn’t even start to touch on what PHPUnit does but most of the times you are only playing with the basic features, I’m a bit bias about phpt tho. While showing how important tests are while refactoring Sebastian showed people how to solve code smells, a term coined by Martin Fowler but he added a little bit that I didn’t know about it, while Martin was writing it he had a new born baby in the household and his wife kept telling him “if it smells, change it” and so he went on to adopt it for coding. A nice feature I wasn’t aware of in PHPUnit is tagging X many tests as a certain group and then having the ability to execute a group of tests in one file (kinda makes the many tests in one file sound nicer) or across multiple files, or so I believe from what Sebastian said. The later parts of the post might look a bit … rushed … they are, I’m sitting here in a hotel in London trying to grab it all from memory :-) Mid through Sebastians session I became distracted with fixing bugs and other food related things and thus missed out on parts of the session, which was a pity, good session, really good. I had my usual train problem in Amsterdam since I always forget what to pick when I’m buying a ticket to RAI, rather weird not having it as an option in the ticket buying machine, oh well … Then I forgot to print out a map so I could walk from the RAI train station to the hotel …. I ended up taking the scenic route … something some of my fellow conference people should be familiar with, it’s a the technical term for getting lost :-P But I got to see some nice looking places in Amsterdam and the weather was really good outside so I didn’t mind really … Seems they finally finished the renovations they were doing around RAI btw, everything looked … different. Now I’m just waiting for some other people to arrive so we can grab dinner, I love the hotel location, smack in the middle of a lot of restaurants and what not. 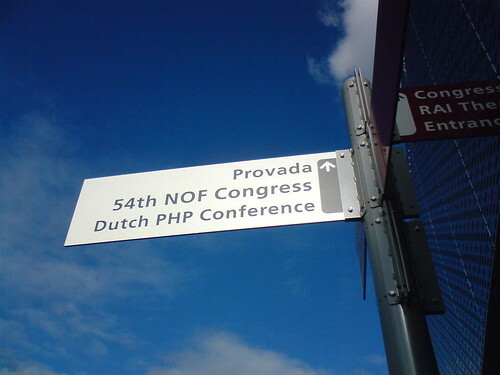 In just a couple of days I’ll be in Amsterdam attending the Dutch PHP Conference and I must say I’m getting some excitement butterflies in me little belly. I’ve been trying to find a legit reason to go to Amsterdam yet again (previously went in 2005 for the International PHP Conference – IPC) and finally decided that the Dutch PHP Conference would be the reason, not only because I liked the city but also because the schedule looks damn good, ranging from Derick R., Sebastian B., Marco T and over to guys like Ivo and the infamous Terry terror (cheesy ? yes ? no ? yeah probably is) and oodles of people I’ve never seen give a talk but sure have interesting topics, I’ve already pin pointed a one or two new talks I’m going to attend. I really like the fact that the conference is held at the RAI convention center, maybe it’s just me but I liked the place and the location, not too far from downtown and not too far from the airport either and this is coming from someone where the capital (Reykjavík) consists of mere 120.000 people. I will try to post more blogs about the conference when I get there and hopefully I can also do another community coverage like for Tek, I have a feeling the EU crowed might be a tad different than the one we saw at Tek, that coupled with some notes on the sessions. His post is pretty good and sums things up rather nicely so go read it! but I want to take a stab (Stab it! Conf pun intended) at it and hopefully bring my own charm to it. 10% of a conference attendees from a single community, to me that feels very impressive and just shows that the community is willing to come together in one place to make the community even more tighter and just make the confs a greate experience and it is always so much fun meeting people in real life that you’ve been talking to for a long time, even many years and you essentially call your comrades. As Ben pointed out we did a great job coming together as a community at this conference and going behind anything I’ve ever seen before, taking new people under our arms, organizing events during the evenings and the days after / before the conference, the gimmick on the bar we frequent, Shoeless Joe or like I call it, Bootless Bill and just the over all flow between people. Another reason why the community aspect is so important is that we could all sit down together and work on code together, in person or just generally brainstorm about ideas, quick examples are the fact Joshua Eichorn, Greg Beaver (btw he’s not a script! Amazing isn’t it ?) and I could get together for a face to face meeting on the status of PEAR / PEAR2 and work on the new installer as well as the new infrastructure, we probably crammed months worth of code into 3 days on and off coding. Another excellent example is the fact that we probably managed to bring down Twitter more than once by going bunkers on posting twitters, it was really hard to keep up with Twitter and #phptek on Freenode, which were yet another example of how the community could drag in other conference attendees and interact with them, some people are just generally shy and like to start with such a route. Anyway so we saw Twitter die more than once and more than twice and more than 40 times and so people just sat down and came up with Stablr.net, admittedly an idea that many people have had before but being able to discuss it in person, with 20+ other smart people interested in the same thing is just amazing. Then we had the flying elephpant project, parachuting elephpants from really high altitudes. I’d also like to thank Scott for tolerating me this whole time, if it were not for him then I would probably have slept under some bridge nearby. Without a doubt a place we should all go next year to! As anyone can see this is a bit half cooked blog post since it was done on a flight from JFK to Iceland but heck, I think the disorganization just shows how much we did during this one conference. Summer of code is around the corner and I hope to mentor again this year, last years experience was a blast. If you lack ideas what to submit then head to http://wiki.php.net/gsoc/2008 for some ideas but we welcome new ones, so don’t be afraid about being bold. This year we’ll be accepting PHP core ideas (internals of PHP it self), php infrastructure (websites and such), PHP-GTK, PEAR, PECL, PHPUnit and SimpleTest … Hope I’m not missing anything, but anyway if you are interested in ANY of those projects then please go a head and read the wiki to get a general idea of things and then make up a idea of your own. Students can start submitting their applications to projects, the deadline is 31 March so get a move on people! I want to see YOUR applications in there or I’ll be hunting you down.